I know I am late to the game here but I am getting more and more fascinated by “chamber” studies in which people are placed in a sealed chamber and then emissions from those people (or from other things in the chamber with the people) are characterized. With ever improving sensors, particle analysis tools, mass-specs and DNA sequencing and such this type of work is getting more and more powerful. So today I have been reading the following: Chamber bioaerosol study: human emissions of size-resolved fluorescent biological aerosol particles – Bhangar – 2015 – Indoor Air – Wiley Online Library. Fortunately it is freely available (and Open Access too) from Indoor Air. Biological particles, including skin squames and microbes, are ubiquitous in indoor air and constitute a substantial portion of coarse airborne particulate matter. Human emissions of fluorescent biological particles as measured in this chamber study were strongly associated with the vigor of activities. More than two-thirds of the emissions, on average, originated from the floor even when occupants were seated. Overall, results were quantitatively consistent with previously reported findings from observational monitoring in a university classroom. 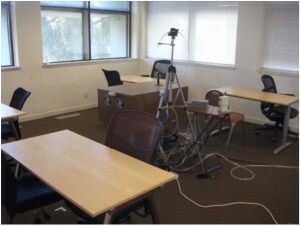 This study adds quantitative information to the emerging body of evidence that human occupancy contributes meaningfully to indoor bioaerosol levels. At present, health impacts linked specifically to bioaerosols emitted by humans are unknown and might conceivably include both positive and negative outcomes. Health effects could depend on source composition profiles of environmental and human bioaerosol reservoirs that feed emissions, including the human body itself, clothing, and indoor dust. These results set a foundation for evaluating occupant FBAP emission rates for human activities in a range of domestic, workplace, recreational, and transport microenvironments. Future work could usefully assess the magnitude and determinants of interindividual differences, for example whether some people are ‘super emitters’ and, if so, why. Finally, there is a need to further elucidate the composition of heterogeneous indoor fluorescent particles. That is, to what extent are these biological particles human, bacterial, fungal or other? Efforts are also warranted to develop techniques to identify and characterize non-biological components that may contribute to the fluorescence signal. Insights into the identity of common groups of indoor fluorescent airborne particles will support the use of laser-induced fluorescence as a convenient technique for assessing, with high temporal resolution, sources, and dynamic processes influencing bioaerosols in occupied environments. The experiments were conducted in a controlled environmental chamber (Figure S1a) that simulates an office room. The room is situated on the second story on the southwest corner of a university building (Arens et al., 1991). Its physical dimensions of 5.5 m Ã— 5.5 m Ã— 2.5 m correspond to an interior volume of approximately 75 m3. The flooring comprises 0.6 m Ã— 0.6 m rubber-backed tiles, topped with closed-loop nylon carpeting. The tiles were approximately two years old at the time of this study. The chamber has large, inoperable, triple-glazed windows along its two exterior walls and is served by its own heating, ventilating, and air-conditioning (HVAC) system, which was installed in 1989. The HVAC system is configured to supply thermally and humidity conditioned outdoor air, without recirculation, that has passed through MERV-7 pleated filters. The air is cooled (with chilled-water coils) to a target set-point temperature (5—15°C) and then heated, first with a water-based system and finally with electrical resistance, to maintain the desired interior air temperature. For this study, the indoor temperature target was 22°C. Air was supplied to the room from an underfloor plenum through floor-level diffusers. A ceiling fan was operated on a low setting (approximately 50 revolutions per minute, blade diameter = 1.5 m, three blades) to maintain mixed conditions in the room. The steam humidifier in the HVAC system was off, except for a few cases in which relative humidity (RH) was manipulated as a study variable. Anyway – I think we will be seeing more and more studies of built environments and occupants using chambers like this.